Kohlapuri chappals or Kolhapuri are kitschy handcrafted slippers made form leather. A pair of kohlapuri chappals can can compliment a jeans and tshirt look as well as ethnic fashion wear like saree and Salwar Kameez. These chappals have gone through various innovations in the last decade, and have gained popularity across India and the world. In an attempt to boost the production and market of Kolhapuri chappals, the Maharashtra State Khadi and Village Industries Board has recently conducted a workshop for representatives and artisans. According to the participants the workshop was not a successful bid as it focused on digital marketing rather than the actual grievances of the chappal makers. And here comes another attempt to revive the dying legacy. The state government is planning to conduct an in-depth research and will soon start the process of obtaining a patent. The research will be conducted by Kolhapur’s Shivaji University. HISTORY OF KOLHAPURI FOOTWEAR The Kolhapuri chappal is the world famous handcrafted footwear which was initially specially designed in the Kolhapur town of Maharashtra state in India. These handmade leather footwears are tanned by using vegetable dyes. The traditional designs of the Kolhapuri footwear are very famous not only in the rural areas of Maharasthra but also across the globe. The Kolhapuri footwear was also referred by different names depending upon the place it was manufactured like Kapashi, Paytaan, Kachkadi, Bakkalnali, and Pukari.The Kolhapuri came into existence as early as the 13th century. History has recorded that it was started and designed by the Saudagar family in 1920. 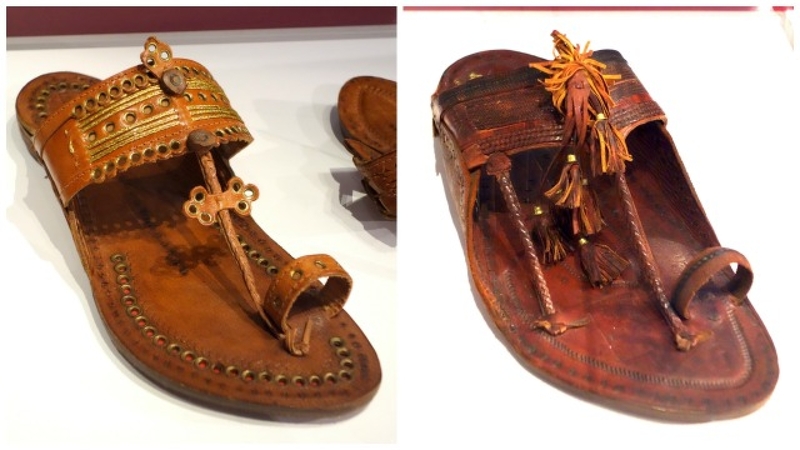 The first model which was designed earlier was much thinner than what is available now and was also known as chappal with ears or Kanwali for it had two side flaps. The upper portion of the footwear was intricately designed. Long before ‘Make in India’ became a catch phrase for a modern, entrepreneurial India, the busy town of Kolhapur was the hub of many forms of indigenous commerce and enterprise. Famous as much for its fiery cuisine as for its superbly crafted jewellery, it also lent its name to the well-known Kolhapuri chappal, which became both a style statement and a comfortable accessory. Now, in the dusty bylanes of Kolhapur, makers of the footwear are bracing themselves for the industry’s decline – if not demise. The problems have been building up over the years, but the final nail in the coffin, as it were, is the scarcity of the basic raw material-leather. The state government’s enthusiasm in enforcing its law against beef has had a downstream effect which is systematically decimating this industry. The place to get the best kolhapuris in Mumbai is “SAI VAIBHAV FOOTWEAR” located at Khar west, Linking road. Since 1983 it is known for quality footwear & Kolhapuri chappals. Each product is still handmade by the craftsman in traditional way preserving the ethnic heritage of India.